Mit den ganzen Accounts die man so als Social Web User zu verwalten hat, ist man manchmal etwas überfordert und vergisst vielleicht die sensiblen Daten zu sichern. Das geht jetzt ganz einfach und kostenlos über Backupify. Einfach anmelden und die vorhandenen Accounts sichern. The short answer is that your online data is important and Backupify is an easy cost effective way to protect it from loss. The longer answer is that much of the data you generate today is not stored on your computer. You have data locked up in Gmail, Facebook, Twitter, Google Docs, Basecamp, and all the other online services you use. Backupify is not just about backup, it is about controlling your data yourself instead of having it stored in hundreds of services all around the web. Your online data is just as important as the data on your computer. Both should be backed up. You can read more about reasons for backing up your online data in this blog post. If I use Backupify, where does my data go? We store all of your data on the Amazon cloud. We chose Amazon after a careful analysis of their security and data duplication policies. For some specifics about why we like Amazon, read this. The reason we chose Amazon over building our own cloud infrastructure is simple… in the unlikely event that something ever happens to Backupify, you can contact Amazon to get your data back out. Why should I backup my data to another cloud? Isn’t that just as much of a concern? Not really, for three reasons. 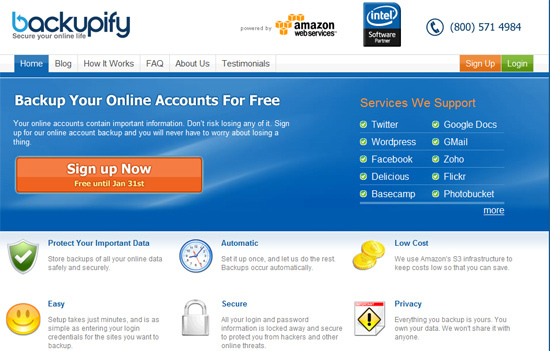 First of all, you can download all your Backupify backups to your computer so that you can have a third copy. Secondly, when calculating the likely failure of two independent systems, you multiply the probabilities. What that means in plain English is that the likelihood of two independent systems failing at the same time is so unlikely that you really don’t have to worry about it. Third, if Amazon did fail and lose your data, once they came back online your backups would kick off again and re-backup everything you had before.